State of the art in oncologic imaging of Colorectal cancers. This is the fourth post in a series in which I will address the state of the art in oncologic imaging based on a review paper; Advances in oncologic imaging†‡ that provides updates on the latest approaches to imaging of 5 common cancers: breast, lung, prostate, colorectal cancers, and lymphoma. This paper is published at CA Cancer J Clin 2012. © 2012 American Cancer Society. The paper gives a fair description of the use of imaging in interventional oncology based on literature review of more than 200 peer-reviewed publications. In this post I summaries the chapter on colorectal cancer imaging. It reviews current and developing radiologic practices in CRC with respect to screening, preoperative evaluation, surveillance, and post-treatment re-staging. “Diagnosis and clinical staging of primary colonic adenocarcinoma is most often accomplished by combining colonoscopy with biopsy and performing cross-sectional imaging to detect metastatic disease. Coronal reformatted CT scan of the abdomen and pelvis shows a left colon primary adenocarcinoma causing colonic obstruction. 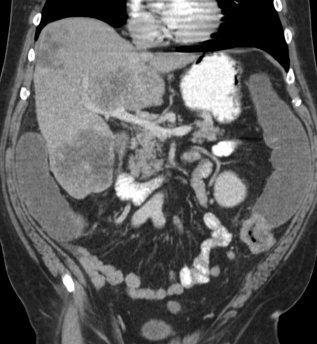 Three-dimensional rendering from CT colonography shows a right colon adenocarcinoma which was stage T1N0. MRI is the most promising imaging modality for management of rectal cancer. Staging of this cancer is primarily accomplished with US, typically performed by surgeons. 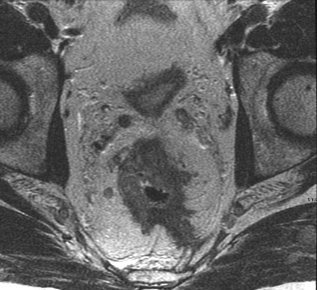 MRI using phased-array coils provides complete visualization of the pelvic anatomy and, especially, the circumferential resection margin, an important landmark for the standard total mesorectal excision. 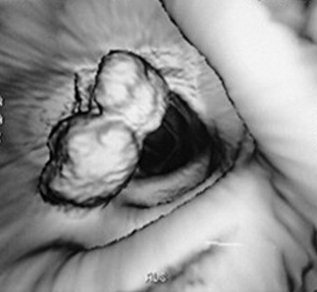 In an MRI of rectal carcinoma, the T2-weighted axial image shows rectal mass penetrating the wall and extending to the left posterolateral mesorectal fascia (also known as the circumferential resection margin). “Imaging plays a critical role in 1) determining response to systemic and loco-regional treatment of liver metastases, 2) assessing response to local treatment and restaging rectal cancer primary lesions, and 3) detecting and assessing the treatment response of extra-hepatic metastatic disease. Systemic treatment (and in some centers, hepatic artery infusion) of non-resectable liver metastases with chemotherapy aims at reduction of the metastatic burden, which, occasionally may allow attempts at curative liver resection. Loco-regional (“liver-directed”) therapies include radiofrequency, microwave ablation, transarterial chemo- or particle embolization and irreversible electroporation. With these treatments, responding lesions can actually increase in size, and simple size criteria are no longer sufficient to determine response. The European Association for the Study of the Liver has issued new criteria to assess viability of remaining tumor based on enhancing residual volume by multiphase CT or MRI.152 However, the field is rapidly changing and there is no consensus on the optimal imaging strategy following loco-regional therapy. Please consider to remove the last part on the Liver and please create a new stand alone post on Liver Cancer Medical Imaging, Dr. Ritu has few posts on Liver, It will be the subject of the forthcoming e-Book on Metabolomics. I wish you to have in this e-Book several posts in Liver CancerImaging and on Gastric Cancer Imaging. I’m happy to write about imaging in Liver. There are many issues to cover so no need to take the piece from this post.